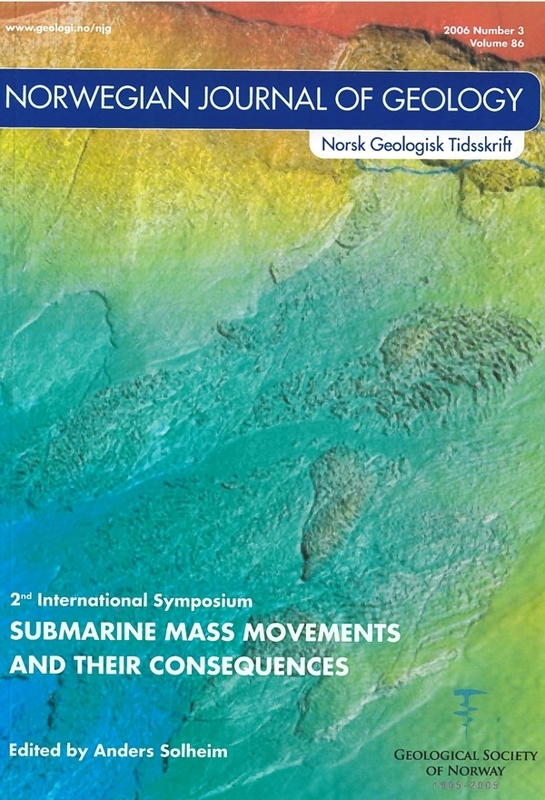 The frequency of submarine landslides was investigated through the occurrence of sandy turbidites in a 16 m long piston core and a shorter gravity core from the abyssal plain of the Lofoten Basin, Norwegian Sea, and with correlation to high-resolution deep-towed side-scan sonar (30 kHz) and seismic reflection data (5.5 kHz). The turbidites occur in five intervals separated by periods of hemipelagic mud deposition. The youngest turbidite (interval 1) is correlated with the Trænadjupet Slide (c. 4 14C ka BP). Three older turbidites (interval 2), one of which correlates to the Nyk Slide (c. 16 14C ka BP), were probably released during the late Weichselian, preceded by a long period (the middle and early (?) Weichselian) of hemipelagic sedimentation. The interval 1 and 2 slides occurred during or after the presence of the Fennoscandian Ice Sheet at the shelf break, indicating that their release was related to the presence of grounded ice at the shelf break. We suggest that submarine landslides were favoured by sediment and ice sheet loading during the glacial maxima (Late Weichselian), and by earthquakes induced by the isostatic rebound following ice sheet melting (Holocene). For the pre-middle Weichselian intervals 3, 4 and 5, neither the age of the slides nor the glacial history are known in detail. Also in this period the turbidites occur only in certain time periods, and are separated by longer intervals of hemipelagic sedimentation. We speculate that the pre-middle Weichselian turbidites were deposited as a consequence of slides occurring during or immediately after Marine Isotope Stages 6, 10 and 12 glaciations, i.e. inferred periods of ice advance to the shelf break.